Review: Theory of Obscurity: A Film About The Residents – Sanspoint. There are certain bands and artists which risk becoming a shibboleth among a certain type of Serious Music Nerd: names like Jandek, The Shaggs, Pere Ubu, and—probably the biggest of them all—The Residents. I’m no fan of cultural shibboleths. The more you love an obscure artist, the more you should preach their name from the mountaintops, in the hopes that others will be compelled to listen. Most might only listen once, but the ones who come back will become fans for live. Though this, those artists gain longevity. In the film, Homer Flynn, who is one of the band’s handlers via The Cryptic Corporation, and their graphic designer notes that the band may not have any hit albums, but they do have a hit T-shirt—with the image above. Theory of Obscurity: A Film About The Residents dwells very little on the mystery of the band, to its benefit. Fundamentally, it doesn’t matter who the people are behind the eyeballs. What matters is their body of work: musical, visual, and performance. _ It takes the band’s forty year-plus evolution and puts it center stage. Drawing from the band’s extensive archives, going back to their first audio tape experiments from 1969, it explores the development of the band and their impact on art and culture. There’s interviews with figures you expect from the music world: Les Claypool (Primus), Gerald Casale (DEVO), Michael Melchiondo (aka Dean Ween of Ween) and Jerry Harrison (Talking Heads), and interviews with folks you might not: like Penn Jillette of Penn & Teller, and Simpsons creator Matt Groening. 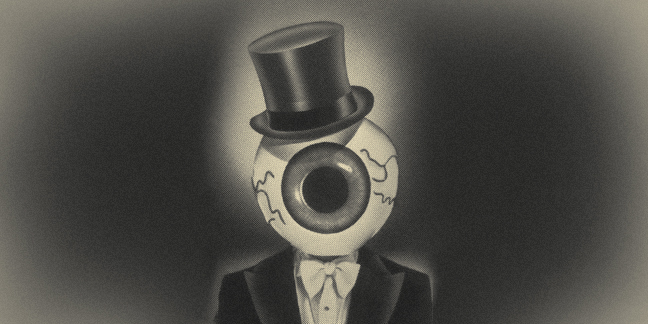 Theory of Obscurity_ gives the audience a peek into the remarkable artistic world of The Residents, and a sense of the exploration and process they have cultivated over their multiple decades of work. Theory of Obscurity should be a source of inspiration for anyone who creates art. To paraphrase Penn Jillette (since I didn’t write down anything in the dark theater), the important thing isn’t knowing how to do something, it’s knowing how to finish something. It’s a mantra that runs through the film. When you take away the masks, the theories, the lore, what stands is a four decade run of creative work, because The Residents finish things. If four weirdos from Shreveport can, so can you. That is advice for life.